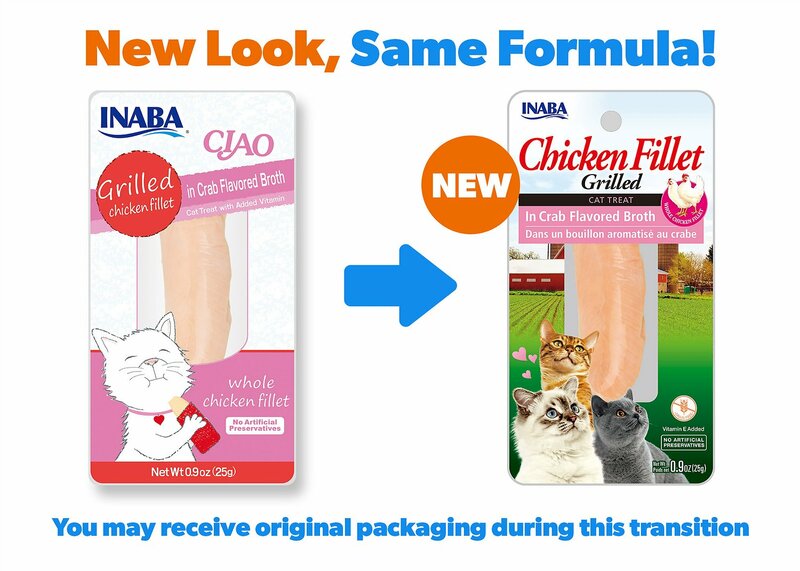 Turn meal time into yum time with the Inaba Ciao Grain-Free Grilled Chicken Fillet in Crab Flavored Broth Cat Treat. “Ciao delicious!” your hangry kitty will say when you serve up this hand-cut, lightly-grilled fillet of farm-raised chicken, packed with flavorful protein fit for your little carnivore. The ingredients list is simple—with real meat, broth and added vitamin E for a boost of nutrition in every meaty, tender bite, with zero junk ingredients like grains or anything artificial. It’s great as an anytime treat or snack, or as a food topper to make meals simply irresistible. 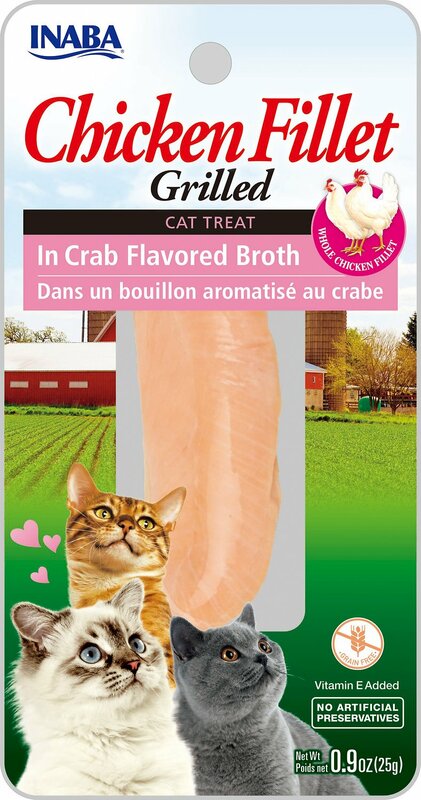 Plus, since it’s made with real broth, it adds plenty of moisture to help keep your kitty hydrated and support his well-being, tail to whiskers. Chicken, Natural Crab Flavored Broth, Salt, Sodium Tripolyphosphate, Vitamin E Supplement, Green Tea Extract. Another hit with my two kitties! They love a lot of treats from this brand, especially the lickable treats. One of my cats usually takes her sweet time with her food and she devoured her half in record time! Will definitely be purchasing more of these fillets in the future! My cat loved this treat. And i like that it was actually a whole piece of chicken. Our cats love these and are given them as a treat periodically. The broth doesn't smell good to us, but doesn't bother the cats. Love, love, love Chewy. They did miss an item on my last order though. It’s so convenient to order from here and items come so fast!